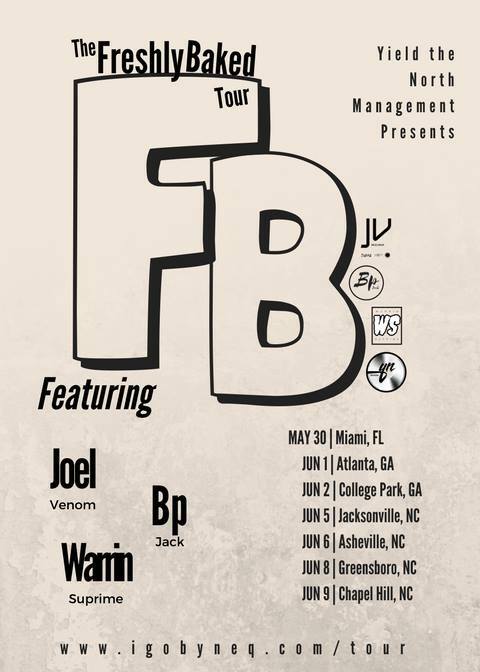 Catch Joel Venom, Warrin Suprime & Bp Jack On “The Freshly Baked Tour” Starting May 30th! Yield The North Management presents “The Freshly Baked Tour” which will include Joel Venom, Warrin Suprime & Bp Jack. The 3 have been making a name for themselves in Raleigh,NC and plan to hit these 7 cities with everything they got. The first stop will be in Miami, which will be exciting and the tour ends off in Chapel Hill,NC! If your planning to attend these shows make sure you check out the links below, nothing but good vibes!